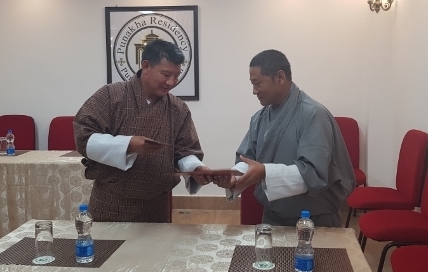 The Ugyen Wangchuck Institute for Conservation and Environmental Research (UWICER) signed Memorandum of Understanding (MoU) with the College of Natural Resources (CNR) on 21st April 2018. This MoU forms the renewal of the MoU which was signed between the two institutions on May 07, 2012 to implement the program of UNESCO Madanjeet Centre for South Asia Forestry Studies (UMCSAFS). 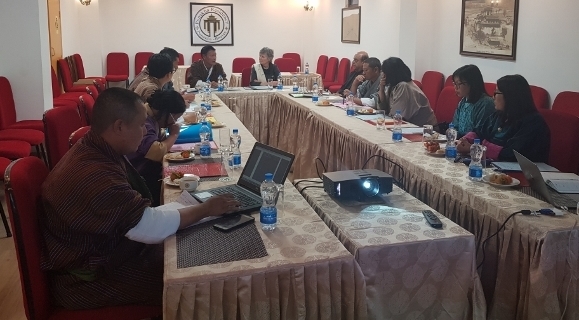 The MoU provide opportunities for interested students from SAARC countries to pursue Bachelor of Forestry and Master in Natural Resources Management at CNR. UMCSAFS shall provide scholarship to students from SAARC countries to pursue the courses at CNR. This far 10 Madanjeet Singh group scholarship students from within the SAARC countries graduated with B.Sc Forestry and B.Sc Sustainable Development and as of now there are 7 Madanjeet Singh group scholarship students pursuing B.Sc Forestry at CNR. The signing of the MoU was graced by the Secretary, Ministry of Agriculture and Forests, Madam France Marquet, Principal Trustee of the Madanjeet Singh Foundation, Mr. Navin Chawla, Advisor to Madanjeet Sigh Foundation, Director of the Department of Forests and Park Services and the members of the Advisory council of UMCSAFS. It was signed at the end of the 2nd Advisory Council meeting of UMCSAFS.